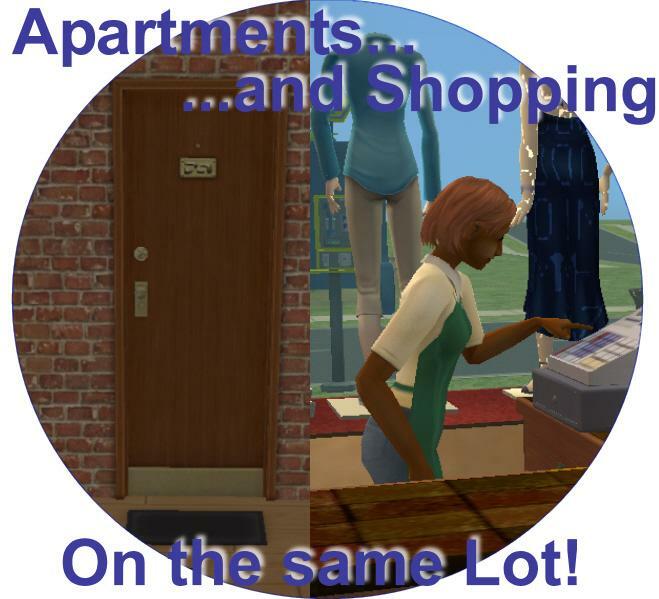 Mod The Sims - Apartments and Shopping, on the same Lot! I've always wanted to build a High Street lot where there were shops on the ground floor and apartments above them. When the Apartment Life EP came out I was sure this would be possible, but I was disappointed. This mod brings you the very few changes that are necessary in order to make it possible. You can now build a combo-lot, one that is residential (specifically apartments) but with a community lot flavour too. The lot will be an apartment lot when you make it, not a community lot, so you cannot send Sims to it like a community lot. This mod will spawn the required NPCs for objects, for example, a Clerk to manage a cash register. This mod does not spawn additional visitors, as with your neighbours, the landlord/lady and walk-bys there will be quite enough people on the lot as it is. Various objects are 'fixed' in this package to allow them to be used on such a lot. If you find a community object that you want to use on such a combo-lot doesn't work (or doesn't work correctly), press the appropriate button below to check whether it is part of the package, and either way, let me know so I can fix it or add it. I have also built an example lot to show you what I was imagining as I made this. I hope this encourages you to make other combo lots. Home Business are also disabled by Maxis on Apartment Lots. This mod does not change that fact. This mod only requires you to have the Apartment Life EP. It has been tested using the AnyGameStarter in exactly such a configuration. If you also have other EPs, the community objects from those EPs will also be able to work in this sort of combo lot. In order to make a lot that has community lot features (e.g. shops) and apartments as well you must follow these instructions. Ensure that any community lot features are not contained within an apartment or they will (deliberately) not function as community lot items. For example, if you place a cash register inside an apartment, a Clerk will not be spawned to operate it. Start by building a residential lot (this is necessary for the apartment to work later). Build your lot as far as you can - you will notice that the community lot buy mode stuff is not available. These two threads contains various apartment building problems including those to do with mailboxes. It would appear that buyable mailboxes have caused many problems with the building of apartments. While there are no families living on your lot you can repeat these steps as often as you require. If you need to make changes after a family has moved in, you must move them out first. Take it easy with objects that spawn NPCs as having lots of extra Sims in your lot all the time may well cause your game to run slower. The various objects that spawn NPCs are marked with * in the lists below. For those of you interested in the gory detail (or trying to work out if your favourite community object will work in a combo lot) click here. In the lists below, any item with an * means that an NPC is spawned through the use of this object. Any item with a means that clones of this object should work since a global BHAV was updated to make it work (although I cannot be responsible for what other Modders do to cloned objects that might stop them working!). Any item with means a clone of this will require the changes I made to be made to the clone as well. In all cases - recolors of these objects will work fine. I have tested this type of lot with the following community lot shopping related items and made updates to them as required. If I have missed any, let me know and I will test and update the items to make them work. Countertop Game Display from Group Interaction LTD. Try On Clothing Booth by MegaSecure Co. I have tested this type of lot with the following community lot entertainment related items and made updates to them as required. If I have missed any, let me know and I will test and update the items to make them work. Some community lot objects rely on the fact that there are always lots of people at a community lot. There should be quite enough people on your lot with your neighbours and the landlord/lady, plus any random walk-bys, so no further Sims are spawned by this mod. You may have to get to know your neighbours at little before you can get them to join in with your games. N.B. The bars that were shipped with the base game do not spawn NPCs on Community lots anyway, so they are not included here. "Pinmaster 300" Bowling Alley by Hurling Fun Products, Inc. I have tested this type of lot with the following community lot service items and made updates to them as required. If I have missed any, let me know and I will test and update the items to make them work. This mod clashes with Pescado's No Auto Pet Buy mod. The alternative download removes the Pet Displays from the objects that can be used correctly on a combo-lot and thus removes the clash. Mod note: This mod also clashes with Sophie-David's Buy Clothes Anywhere patch. If you want to use both, you should download the edited version of Apartments and Shopping from the Buy Clothes Anywhere thread. I don't know of any other mods that this mod clashes with, but there is always the possibility. The pertinent information for the owner of the other object is here. Alternative download provided that does not contain the fixes to allow Pet displays to work since they clash with Pescado's No Auto Pet Buy mod - as requested by KevinTMC who also found the clash. Fixed bars so they work. Number of restaurant servers is based on the number of tables in the same room as the podium (just like in hotels). Added various items from H&M SP now that I have it. Thanks to KevinTMC for reporting a mod clash.